Go to breakfast early and dinner on the later side as 6:30-7pm is very business and rushed. Bring your own swimming goggles and snorkling gear as they are not available on board the ship. Realize this is not luxury cruising before you go and then head to the Compass Rose bar for a drink. Great to be able to swim from the rear "marina". Don't miss it. This is a warm weather destination ship. Designed for warm weather and life on the deck. If you have rain or inclement weather, it feels small and congested. Small and relaxing...goes to islands we had never heard of before and not the normal tourist full of cruise folks places...most of the time we were the only ones around! only tip i can give- go on her give it a try, you wont regret!!! On this trip, the sailing catamaran excursions were super, especially in St. Barts. The champagne snorkeling adventure on Dominica was fabulous, the Dive Shop (AL Dive) crew who were safety conscious above all else, but who made sure everyone had a great time, could not have been better. 300 pass., good size for value and embarking/disembarking. Ship is in very good shape, recent renovation, but some old design issues hold it back from being "perfect". Terrific crew, food mostly great. Free non-alcoholic "smoothies" all the time, poolside. Internet $$$ - sold by MB's, not time. The ship does not not dock at ports of call. You must go down a flight of ten steps to a platform on the rocking ship and transfer down another couple of steps into a rocking tender. Don't know what happens at the other end of the trip as I have limited mobility, was not informed of this feature of the cruise, and was unable to leave the ship for an entire week. Do it, it was so different to a cruise ship. Atmosphere is very relaxed Nd you are know by name by everyone, how, I don’t know! experience an open Bridge where you really can talk about the route, weather And see what a working bright feels like. Be part of a working yatch and really get to know other passengers. Take lots of books to read, sewing, painting etc to fill your days. Yoga and Pilates and stretches are not charged for. The cabin on the second floor was extremely well laid-out. The only drawback was that there was no balcony, only a porthole. Since we only slept and got dressed in our stateroon, it wasn't a big deal and part of the bargain for having a smaller, more intimate cruise vessel. 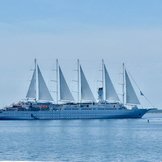 If you want a ship with lots of activities, do not sail with Windstar. 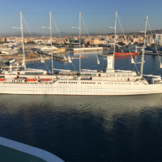 If you want a small ship experience that goes to interesting ports, quite often those ports the large ships do not go to, and you want a friendly staff and enjoy looking at lovely sunsets and the stars at night, then Windstar is for you. Not your typical Cruise. Much more intimate !